The New York Mets have this pretty awesome pitcher rotting on their AAA Las Vegas team. The Mets also have a pretty awesome pitcher in Flushing that is on an innings limit. Why not use these two pitchers to create a dynamic tag team of sorts? 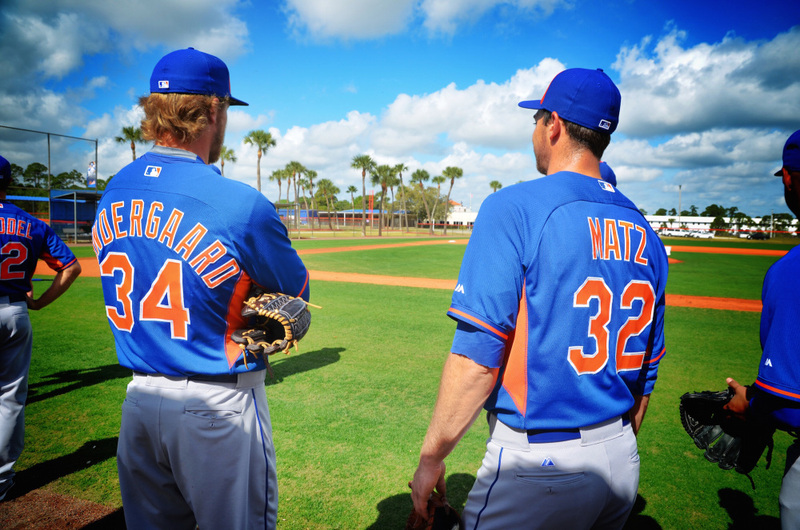 Noah Syndergaard and Steven Matz should be the next great tag team. Innings limits are nothing new to baseball. Every MLB team uses innings limits to “protect” their prized young pitchers, even though there’s nothing to prove that it works. Here’s a crazy idea. Instead of wasting Matz’s innings in AAA, call him up. The kid has proven everything he needs to. Even in the PCL, he’s dominated. Look at these numbers. I’m not going to tell you who should be shipped out or traded (Dillon Gee/Jon Niese), because I don’t get paid to. Let’s say that the Mets now call him up. What should the Mets do with him? Go with a 9 man rotation? Use him in the bullpen? How about teaming him up with their other top pitching prospect, Noah Syndergaard. Instead of burying one of these guys in the bullpen, team them up every fifth day. Have Syndergaard slated for the first five innings and then have Matz ready to finish the last four. The next time around the rotation, have Matz go the first five and then Syndergaard the last four. What makes this work is that Matz is lefty and Syndergaard is righty. Both pitchers are on pace to throw about 175-190 innings, which is obviously a no-no in this day and age. If four or five innings every fifth day is not enough, one of them can throw an inning of relief here or there. I’m not claiming that this will work. And to be honest, if the Mets did subscribe to this approach, both guys would probably need Tommy John surgery after the second time trying it. But doing something like this can give a guy like Matz the MLB innings and experience that he’ll need for 2016. It’s unconventional, but the Mets need to do something out of the box. They can’t keep wasting talent that is MLB ready, when operating on a shoestring budget.